A limited number of students (20-50) working in interdisciplinary teams. The course runs within a limited period (1-5 weeks) during the summer or winter. The teaching format is characterized by group work, active participation in class and project oriented teaching. Innovation summer schools might seem more intense compared to courses that are part of the ordinary semester structure, and the students may find the innovation projects, the sense of community and the “spirit” within a summer school highly inspiring. 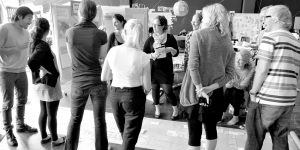 Read the guidance below on how to organise an innovation summer school in relation to theme, coordination and planning, the physical environment, materials, the staging as well as process design and facilitation. At the bottom of the page you will also find a time schedule for developing an innovation summer school as well as inspirational materials and examples. As a rule a summer school should be planned as a regular I&E course with a suitable link between the learning objectives, the activities, form of examination and evaluation criteria. Besides this there are however certain aspects of the planning and execution of an innovation summer school, which are described in the sections below where you will also find a guiding time schedule of the development of an innovation summer school. The link beneath provides you with a guiding time schedule that displays the activities needed for developing an innovation summer school (in relation to an existing curriculum). The time schedule illustrates focal points, activities and important deadlines and may be used as inspiration when you are developing a course in the innovation summer school format. A disciplinary theme could for example be: service innovation, bio inspired innovation, clean-tech innovation or digital services in which the course learning objectives are fulfilled through the disciplinary theme. The disciplinary theme mainly depends on the contracting department offering the course and the available teaching resources. When a theme for the innovation summer school is to be decided on, you can look into what kind of summer schools that already are avalable in the course catalogue/has been offered previously and which disciplinary theme you find interesting and inspiring – both in relation to your own participation and the students’ potential projects, but also in relation to the possibility of gathering a group of teachers, recruiting students and involving relevant external experts and practitioners, organisations and firms. You need to be especially attentive to the way in which the disciplinary theme provides the opportunity for the students to use their academic knowledge in the interdisciplinary developmental collaboration. Course enrolment and registration: an interdisciplinary summer school might involve administrative challenges and it may be time consuming to deal with course registrations of students from many different academic disciplines and perhaps also letters of intent. Cooperation with external partners: the cooperation demands preparation before the course begins as well as coordination throughout the course. Read more here about using innovation cases and external cooperation in teaching. Coordinating interdisciplinary groups of teachers: recruiting teachers and arranging classes with these in the playbook also require planning. Communication: Communicating the process of the course to students, teachers and external partners is an important element of a well-organized summer school. The summer school has to be completely planned before the course begins, as there will barely be any time for adjusting content and format during the course. As such it is recommended to assign a coordinator that will take care of the framing of the course and the practical coordination. Learn more about the role of a coordinator here. The physical facilities and interior helps to support and stage the disciplinary theme and it can also engage and inspire the students. It is therefore important that the students can establish their projects in their own workstations in order to unfold their projects effectively e.g. when organising visual material from fieldwork, research, idea development and more. The room (e.g. Haner, U. E. (2005)) and working with visual materials have a great impact (e.g. Razzouk, R., & Shute, V. (2012)) on creativity and problem solving, and the students should be able to work with visual representations of e.g. knowledge and ideas when analysing complex problems and developing solutions in an iterative process. This type of set-up is also particularly suitable for interdisciplinary collaboration, where there is a need for communicating across disciplinary borders. Visual and tangible materials such as prototypes and sketches are as such able to support the dialogue on complex subjects, both among students from different subject disciplines, but also between all involved actors connected to the course and the students’ projects. Workstations: the students need to be able to use workstations/project rooms, located in the same area, throughout the course in order to be able to work efficiently with their projects. In order to facilitate the student teams, it is important that the workstations are placed within the same area, e.g. within a large room in which the workstations are separated by room dividers. Materials: As a minimum the students will need office supplies such as post-its and flip-over paper. It may be necessary with smaller workstations in which the students are able to build prototypes. Have a look at the overview of the materials needed for a simple prototyping kit. You may also cooperate with laboratories, libraries or workshops. If the course entails detailed prototyping you could consider contacting KUB Nords’ 3 D Workshop. Staging: The physical facilities may be organized with reference to the disciplinary theme, or take place close to relevant environments that provide associations to the theme of the summer school. Use the available facilities and, if possible, use surprising and different elements in order to inspire. However, it is of course first and foremost important to have functional rooms rather than inspiring rooms, in case you need to prioritize. During the course you may encourage the students to arrange and décor their workstations. There is a guide on how to do this here: The Group’s workstation and identity. Please also have a look at the collection of photos from previous innovation summer schools and become inspired. 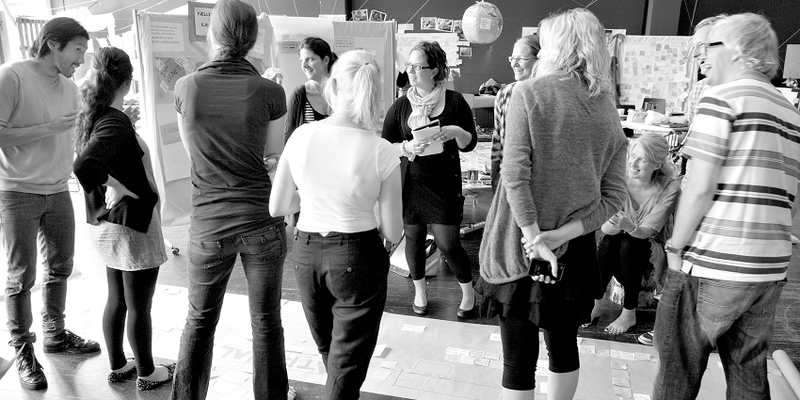 Chosing an overall approach or process model for your innovation summer school. Deciding which activities the students need to do during the course as well as how these activities support the learning objectives. Milestone deliverables as a managing tool for the students and make sure that the deliverables are connected to the activities and the learning objectives. Make sure to be transparent towards the students regarding what the criteria for a good deliverable are and discuss with the students what qualifies a good deliverable. Workshops as a way to provide the students with methods and tools that they are able to use throughout the course, as well as in other contexts of their studies. Combining different ways of teaching such as student guidance sessions, workshops, project work and lectures in order to create a good flow and consistency within the course. A playbook in order to plan the process in details. Find more about the above mentioned topics in relation to the I&E course planning in the menus of the planning section. Examples of deliverables and playbooks are available in the section about teaching materials here. Facilitators are useful in helping the students understand the exercises, methods and in navigating the process, making decisions, as well as motivating and helping in relation to group work and possible uncertainties and conflicts. The students are also able to discuss the application of different methods and theoretical questions about innovation and creativity with the facilitator. As such make sure to assign facilitators to your innovation summer school in order to guide your students towards a constructive process. Depending on the resources available, you may assign one facilitator to each project team or let two project teams share one facilitator. It is also possible to only assign one facilitator to facilitate all project teams. The facilitator should meet with the students on a regular basis and the students need to prepare questions or meeting topics for each meeting. Learn more about facilitating in the section The role of the facilitator. By now different innovation summer schools are/have been offered by different departments across the entire University of Copenhagen. They are designed differently in relation to various course components such as exams, the innovation approach, teaching formats and so on. Click on the link below to see an overview with links to different course descriptions and short descriptions of how the courses are organized.